The notion of the sell-out is always an interesting one to consider – what are you looking for when you set out to become famous, and what is it that you lose when you reach that career apex? A lot of people would say edge, hunger, relevance … typically all of the things that made you interesting in the first place. People who hit it big with their first album, first book, first whatever, often get hit with what is known colloquially as Sophomore Jinx. They can’t replicate what they did before, and the second effort falls flat, and they become one hit wonders; Wonder Boys as the film of the same name would have it. Dying young is unfortunately a great way to avoid being classed as a sell-out. Basquiat Has An Interesting Bio, And That Sells! There is a great scene in the movie Basquiat where someone complains that she doesn’t think the painting she is looking at is going to match her furniture, and Basquiat grabs a bucket of paint and throws it at his work, getting really angry at the attitude that the monetary value of his art is more important to this woman than the art itself. Not that he didn’t want to sell his art – he seems to have been pretty good at promoting himself, but not at the expense of the art. Why am I thinking about this aspect of the sale in particular? Because I read an article where the writer was pleasantly surprised that the purchase of the record breaking piece of art actually seemed to have a genuine emotional attachment to the art, and wasn’t just engaged in a fiscal transaction. The more an artist becomes known and the higher the ticket price on the art, the more this might come into question. Some people tread the line of cult status, and never really break into the stratospheric heights that bona fide famous people occupy. Basquiat did a show with Andy Warhol, there has been a film made about him, but he isn’t exactly what you would call a super famous artist; not a household name. He died young; he died in tragic circumstances … it makes him interesting. People in the know know about him – he is an important artist. 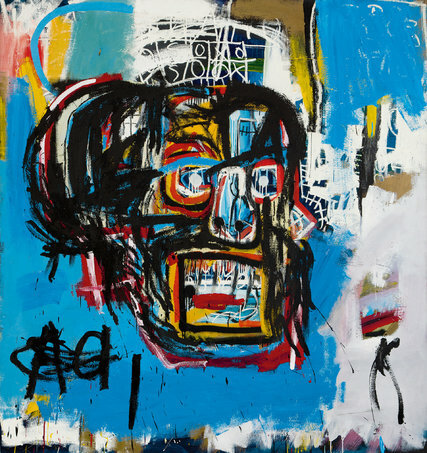 Things may change in regards to how widespread his fame is – one of his paintings just sold for $110.5 Million and that sets a precedent – that means other investors interested in the arts are going to be paying more attention. Sales of his paintings grossed $171 million the previous year, so there has been an uptick in interest in him. His reputation has been growing, and his status as a modern artist is seeing him rank alongside Picasso for some people. One thing that has contributed to the price, is the rarity of works by the artist, and subsequent works that hit the market are likely to be lesser works, but the great thing about art is, when you show it somewhere it advertises itself – it’s not particularly easy to write copy about a piece of art that adds too much to the art that can’t be communicated by the piece itself. So, often what the copy concentrates on is the artist’s story – how interesting is their biography? Having an interesting story, and occupying a niche that no one else is really working in, is a great selling point. Basquiat would have probably liked it … his friend Warhol definitely would. Whatever happens to his work in terms of sales, there is something about it that makes it seem like it could never truly be safe – there is an energy to his work that bristles and leaps off the canvas, so hang it where you will, Basquiat will stand apart from his art as investment, and as you learn about him, and learn about him through his art, its narrative will transcend the talk of dollar value. When something is being sold, of course its worth is important, but how it affects you and your life is often more important … this is true of art, and any other object or service purchased.